some wonderful businesses become even more awesome than they already were. Republic Foods Enterprise Center, Fayette County Commission and c.r.a.f.t. In conjunction with c.r.a.f.t., the Fayette County Commission Action Agency and the Pennsylvania Department of Agriculture, Pick Your Poison has been tasked with evaluating the operations of Republic Foods Enterprise Center's catering locations in Downtown Pittsburgh. Operation assessment, customer and competitor research, and strategic recommendations will be provided to assist Republic in forging ahead and creating new opportunities. 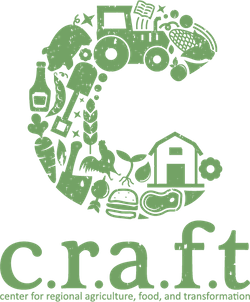 The Center for regional agriculture, food and transformation (c.r.a.f.t) is a newly created center within Chatham University that works to transform the future of food and agriculture in Western Pennsylvania. Pick Your Poison is working with them, Chatham's Food Studies program and Tomanetti's Pizza to create a hyper local pizza made entirely from local ingredients. Our goal is to continue to have a product on the market by 2019 and we're well on our way to that goal. Three Rivers Grown is a fast growing local food distributor bringing regional food to grocery stores and restaurants in the Pittsburgh area. Pick Your Poison recently helped the finish up reporting for a grant they received from the USDA and is working on revamping their sale brochures to make sure their clients stay up to date on their ever changing product line. B52 cafe is a vegan cafe based in the Lawrenceville area of Pittsburgh. They're such an incredible place; scratch made & mostly organic food, delicious coffee and impressive chocolate and beverage programs. PYP's task was to find the best way tell the public about all the wonderful things that B52 has to offer, while refining their messages and getting them ready to break into dinner service in March of 2016. We worked on refining their day parts, and finding creative ways to advertise using their limited start-up budget. Clarion River Organics is an Organic farmer's co-operative consisting of 15 Amish famers located on the Clarion River in Sligo, PA. CRO provides organic produce, meat, and eggs to their robust CSA, farmers markets, and for wholesale distribution. They needed assistance with organization, hiring a new employee, forming a board of directors, and working on ways to better communicate with their farmers. We worked together to ensure that their unique needs were met while helping them grow their business, increase profit, and decrease costs. I was honored to be a mentor in the UpPrize social innovation challenge, working with the Black Urban Gardeners and Farmers of Pittsburgh Co-op as they begin to put the pieces together for a co-operative farm, educational opportunities, and farmer's market in the Homewood and Uptown areas of Pittsburgh. We put together a marketing plan for the competition and are in the process of writing a business plan for their grocery store which should be operational by early 2019. In conjunction with Bridgeway Capital, I wrote business plans for these two businesses in 2017. The existing Larimer corner store called LA Grocery wishes to expand their space by at least 50% to offer more fresh foods, grab and go sandwiches and additional conveniences such as lottery and money order services to the community. Wylie Avenue Bistro located in the Hill District area of Pittsburgh will be opening in the summer of 2019. This chef-lead venture boasts job training programs, community education opportunities and a chef's garden. Building New Hope is an incredible Pittsburgh based not-for-profit Coffee co-operative that purchases coffee from a small village in Nicaragua. They provide the farmers with fair prices for their beans, and return the profits of the coffee sales to the community to fund schools and scholarships. Just because Building New Hope has been in existence for over 10 years, doesn't mean they can't benefit from a fresh look at their marketing plan. Currently, they're looking to streamline their coffee selling division, make more revenue from each bag and increase their market share. Need your daily caffeine fix? Visit Building New Hope's website to order yours today! This exciting Latin restaurant combines unique flavors of some lesser known Latin favorites with the classic taste of traditional Mexican food. Pick Your Poison worked closely with the business owners to research and plan this new restaurant's theme, menu, layout, and overall feel. Construction has begun and this restaurant is set to open in Bloomfield in winter of 2018. Pittsburgh Ice Cream Company is a funky and fun ice cream retailer with a fierce passion for using local ingredients to create amazing flavor combinations. We worked together to redesign the Pittsburgh Ice Cream Company website to better feature their flavors and highlight local partners, all while keeping the copy funny, informative and just a little weird. Check them out here, and try the Salted Caramel Ice Cream. It's the best. Barb is a long time baker and professional chef that has a great story and a fantastic nutrition bar recipe. She started her journey of selling her bars professionally in 2015 and PYP has been lucky to be assisting her from the start. Together, we've worked on product development and refinement, branding, operations, logo and tag line generation, social media management and website & online store creation. Barb's Bars are now featured in coffee shops and farmer's markets around Pittsburgh. Ready to Fuel Your Badass? Click here to order some bars of your own!